Richardson et al.’s respected and seminal Policy Styles in Western Europe (1982) shed valuable light on how countries tend to establish long-term and distinctive ways to make policies that transcend short-term imperatives and issues. This follow-up volume updates those arguments and significantly expands the coverage, consisting of 16 carefully selected country-level case studies from around the world. Furthermore, it includes different types of political regimes and developmental levels to test more widely the robustness of the patterns and variables highlighted in the original book. The case studies – covering countries from the United States, Canada, Germany and the UK to Russia, Togo and Vietnam – follow a uniform structure, combining theoretical considerations and the presentation of empirical material to reveal how the distinct cultural and institutional features of modern states continue to have implications for the making and implementation of public policy decisions within them. 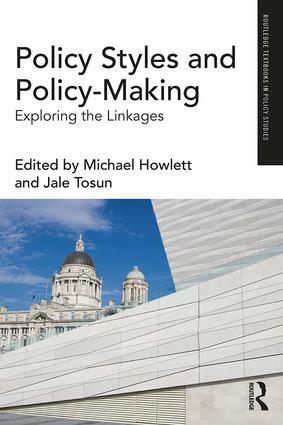 The book is essential reading for students and scholars of public policy, public administration, comparative politics and development studies. A majoritarian UK vs. devolved consensus democracies? Still searching for the rationalist consensus?